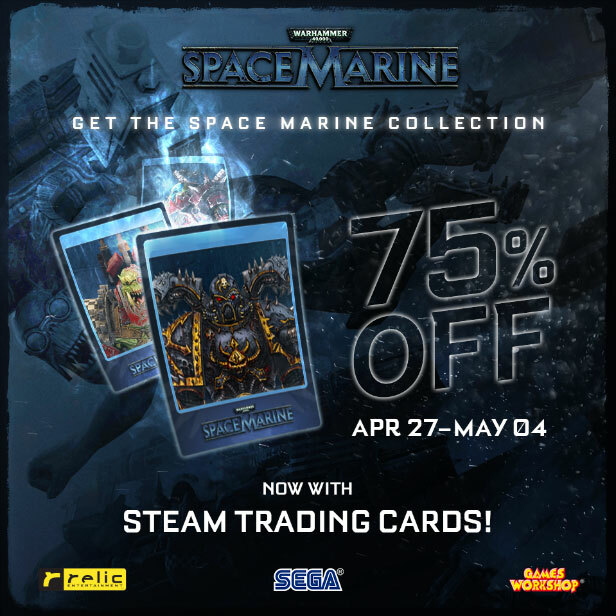 Relic Entertainment has announced that Warhammer 40,000: Space Marine has been newly updated to include Steam Trading Cards, and to celebrate players can purchase Space Marine and the Space Marine Collection for 75% off on Steam from April 27-May 4 at 10AM PST. From now on as players progress through the campaign and multiplayer modes they’ll unlock cards, badges, Steam profile backgrounds, and more! Players can also head to the updated Space Marine website to sign up for updates regarding future promotions and announcements. In Warhammer 40,000 Space Marine players take on the role of Captain Titus, Space Marine of the Ultramarines chapter and seasoned battle veteran. Facing a horde of countless Orks, you must protect the Imperial Forge World, one of the planet-sized factories where the war machines deployed for the never ending battle for humanity are created. This entry was posted on Tuesday, April 28th, 2015 at 10:10 am and is filed under Mature, National News, New Releases, RTS. You can follow any responses to this entry through the RSS 2.0 feed. You can leave a response, or trackback from your own site.